He was caught cheating during the World Cup qualifiers. Fortnite esports player, Johnathan Kosmala, was dropped from Team Kalibur when details emerged that he had cheated during the Fortnite World Cup qualifiers, last weekend. In a bizarre twist, it appears that CBV, the creator of the cheat—allowing you to see player locations through walls and other obstructions—is the one that exposed Kosmala, leading to his dismissal from Team Kalibur. CBV says he's issued a full refund to Kosmala and defends his actions, explaining that Kosmala wasn't cheating to have fun but was taking advantage of professional players with $30 million in prizes at stake. "[Kosmala's intentions] were to win money and scam other players that are playing legitimately," says CBV. "There's no difference between him stealing from these players versus him using this cheat to steal from these players." 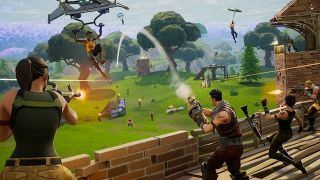 Epic Games has responded to the situation in a statement to Polygon and stressed the importance of the integrity of Fortnite competition. "We actively monitor all official competitions across a wide range of metrics and all winners are subjected to additional monitoring for various forms of cheating, with thorough investigations taking place for any World Cup Qualifying players." A 'game integrity blog' is expected later this week from Epic and will detail "ongoing and future efforts" to curb cheaters.